MEXICO CITY/OTTAWA -- From launching a data-mining drive aiming to find supply-chain pressure points to sending officials to mobilize allies in key U.S. states, Mexico and Canada are bolstering their defences of a regional trade pact President Donald Trump vows to rewrite. Trump has blamed the North American Free Trade Agreement for the loss of millions of manufacturing jobs and has threatened to tear it up if he fails to get a better deal. The automotive stakes are high for both Mexico and Canada, which rely on the industry for thousands of jobs at several major assembly plants and many more parts operations. Fearing the massive disruptions a U.S. pullout could cause, the United States' neighbors and two biggest export markets have focused on sectors most exposed to a breakdown in free trade and with the political clout to influence Washington. That encompasses many of the states that swept Trump to power in November and senior politicians such as Vice President Mike Pence, a former Indiana governor or Wisconsin representative and House Speaker Paul Ryan. Prominent CEOs on Trump's business councils are also key targets, according to people familiar with the lobbying push. Mexico, for example, has picked out the governors of Texas, Arizona and Indiana as potential allies. Decision makers in Michigan, North Carolina, Minnesota, Illinois, Tennessee, Wisconsin, Ohio, Florida, Pennsylvania, Nebraska, California and New Mexico are also on Mexico's priority list, according to people involved in talks. Mexican and U.S. officials and executives have had "hundreds" of meetings since Trump took office, said Moises Kalach, foreign trade chief of the Mexican private sector team leading the defence of NAFTA. For Reuters' interactive graphic, click here. Canada has drawn up a list of 11 U.S. states, largely overlapping with Mexico's targets, that stand to lose the most if the trade pact enacted in 1994 unravels. To identify potential allies among U.S. companies and industries, Mexican business lobby Consejo Coordinador Empresarial (CCE) recruited IQOM, a consultancy led by former NAFTA negotiators Herminio Blanco and Jaime Zabludovsky. In one case, the analysis found that in Indiana, one type of engine made up about a fifth of the state's $5 billion exports to Mexico. Kalach's team identified one local supplier of the product and put it touch with its main Mexican client. "We said: talk to the governor, talk to the members of congress, talk to your ex-governor, Vice President Pence, and explain that if this goes wrong, the company is done," Kalach said. He declined to reveal the name of the company and Reuters could not immediately verify its identity. Trump rattled the two nations last week when his administration said he was considering an executive order to withdraw from the trade pact, which has been in force since 1994. He later said he would try to renegotiate the deal first and Kalach said the lobbying effort deserved much credit for Trump's u-turn. "There was huge mobilization," he said. "I can tell you the phone did not stop ringing in (Commerce Secretary Wilbur) Ross's office. It did not stop ringing in (National Economic Council Director) Gary Cohn's office, in the office of (White House Chief of Staff Reince) Priebus. The visits to the White House from pro-NAFTA allies did not stop all afternoon." Among those calling the White House and other senior administration officials were U.S. Chamber of Commerce chief Tom Donohue, officials from the Business Roundtable and CEOs from both lobbies, according to people familiar with the discussions. Mexico has been the prime target of NAFTA critics, who blame it for lost manufacturing jobs and widening U.S. trade deficits. Canada had managed to keep a lower profile, concentrating on seeking U.S. allies in case of an open conflict. That changed in late April when the Trump administration attacked Ottawa over support for dairy farmers and slapped preliminary duties on softwood lumber imports. Despite an apparently weaker position -- Canada and Mexico jointly absorb about a third of U.S. exports, but rely on U.S. demand for three quarters of their own -- the two have managed to even up the odds in the past by exploiting certain weak spots. When Washington clashed with Ottawa in 2013 over meat-labeling rules, Canada retaliated by targeting exports from the states of key U.S. legislators. A similar policy is again under consideration. Mexico is taking a leaf out of a 2011 trucking dispute to identify U.S. interests that are most exposed, such as $2.3 billion of yellow corn exports. Mexico is also targeting members of Trump advisory bodies, the Strategic and Policy Forum and the Manufacturing Council, led by Blackstone Group LP's Stephen Schwarzman and Dow Chemical Co. boss Andrew Liveris respectively. Senior Trump administration officials and Republican lawmakers in charge of trade, agriculture and finance committees also feature among top lobbying targets. 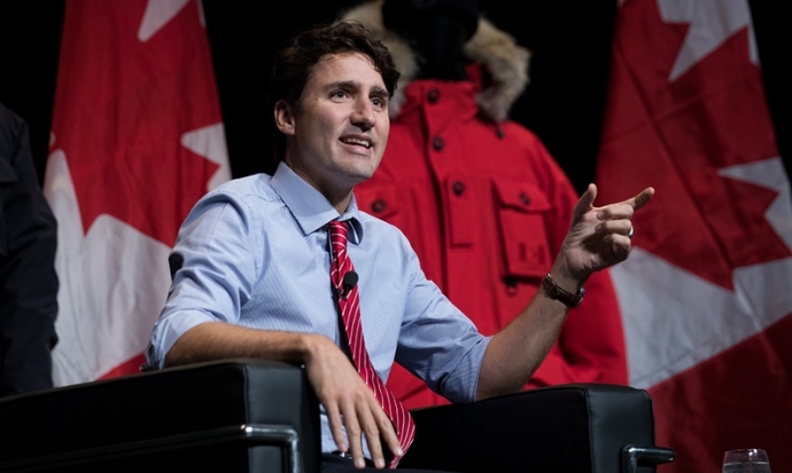 Canada has spread the task of lobbying the United States among ministries, official say, and is particularly keen to avoid disruption to the highly-integrated auto industry. A core component of Mexico's strategy is to argue the three nations have a common interest in fending off Asian competition and exploring scope to source more content regionally. 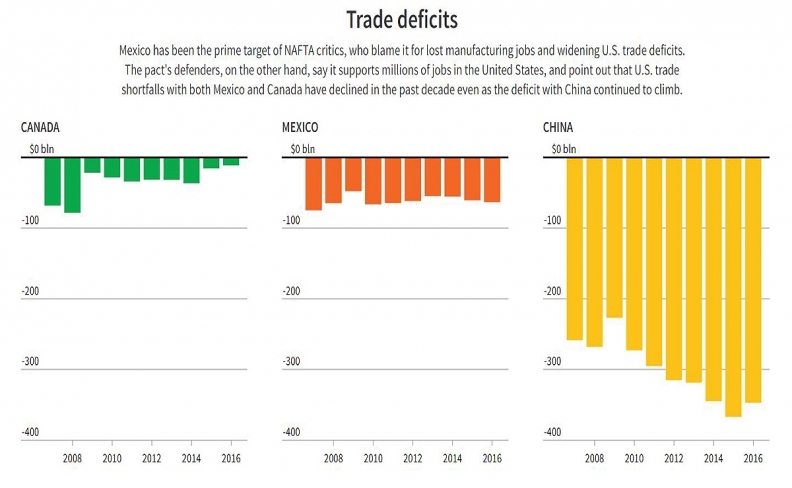 The defenders of NAFTA also say that it supports millions of jobs in the United States, and point out that U.S. trade shortfalls with Canada and Mexico have declined over the past decade even as the deficit with China continued to climb. Part of IQOM's mission is to identify sectors where NAFTA rules of origin could be modified to increase regional content. For example, U.S., Canadian and Mexican officials are debating how the NAFTA region can reduce auto parts imports from China, Japan, South Korea or Germany, Mexican officials say. "The key thing is to see how we can get a win-win on the products most used in our countries, and to develop common manufacturing platforms that allow us just to buy between ourselves the biggest amount of inputs we need," said Luis Aguirre, vice-president of Mexican industry group Concamin.